Mr. Connie Mack Moran opened "CFS" Creative Feathers Studio in LaMarque, Texas in 1976. His expertise was in Waterfowl. 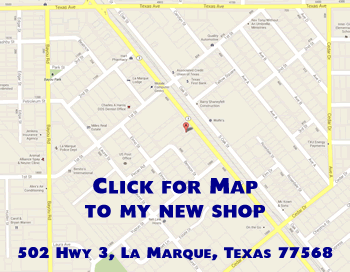 After many years of competitions, and awards in the Taxidermy business, Moran decided to open up a very specialize and successful "Saltwater Fly Shop" located at 502 Hwy 3 in La Marque, TX (just South of Houston, Texas). Fly Fish America magazine has published several of his very creative saltwater flies. In March 05, FFA chose his "Epoxy Shrimp" as 1 of 5 great saltwater flies in America. THE TIDE CAM is down. thanks for looking. NOTE: THE KAYAK FISH BAG IS NO LONGER AVAILABLE TO THE PUBLIC.THANK YOU FOR YOUR BUSINESS AND INTEREST. Works in this site are © Copyright Connie Mack Moran.